In the Neuroethology of Communication research group we aim at understanding how biology and culture shaped the evolution of language. Specifically, we study the social, vocal and verbal processing capacities of three mammalian species (humans, dogs and pigs) in a comparative ethological framework, performing brain imaging and behavioural studies. 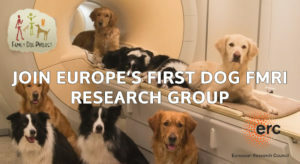 Our lab is among the very few worldwide capable of conducting fMRI and EEG studies on awake, unrestrained, cooperating dogs. In the Family Pig Project we work with miniature pigs that are raised as pets and trained intensely for different neuroethological projects. (1) Comparative EEG and behavioural studies on speech processing. (2) Comparative fMRI and behavioural studies on voice processing. (3) Comparative ethological studies of socio-cognitive capacities in pigs.